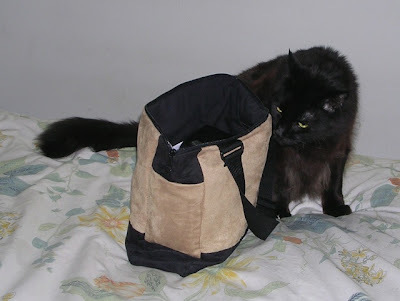 I just bought a new purse - shown above with one of my cats, the 20+ pound Moonshadow. It was super-easy to move the contents from my prior purse to this one, because I've minimized what I carry, and because I use containers to organize things in my purse. You can sort of see the containers when I open the zipper. 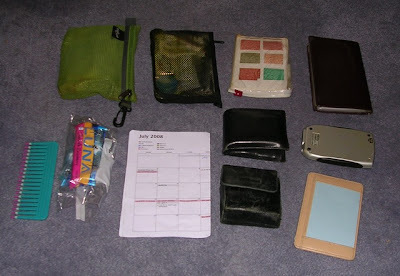 But here are my purse contents laid out so you can really see them. 1. Two mesh sacs carrying medical/first-aid types of things: bandages, Advil, eyeglass cleaner, lip balm, allergy meds, etc. 2. One plastic bag with three Luna bars - a Luna bar being my staple meal-on-the-run for those every-three-hour meals that pop up at inconvenient times. 3. One small plastic bag with fabric samples in my colors - because if I stumble on something while I'm out and about, I want to check and make sure it's a match. 4. A Levenger pocket briefcase, for taking notes. 7. My camera - that's the case for it; the camera was in my hands! 8. A small external hard drive, one of my computer back-ups. 9. A printout of the next two months of my calendar (maintained in iCal on my Mac). 10. A business card holder with cards of wonderful people I often recommend. Not shown in this picture are the pens and Kleenex carried in an internal pocket, and the business card holder with my own cards carried in an external side pocket. Oh, and my cell phone - sometimes in the other external side pocket, right now in the car where I was recharging it. 1. 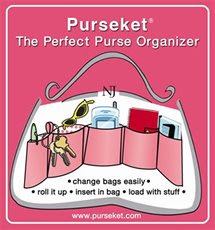 The purseket purse organizer. 2. 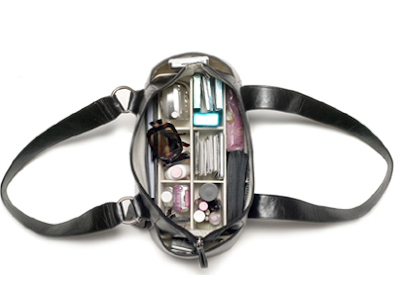 The Butler Bag with its built-in compartments, highly recommended by organizer Monica Ricci. I just love peeking into other people's spaces! I'm off to go clean my purse now - thanks! I've found the key to an organised purse (or as we call it a handbag; a purse being a ladies' wallet) is to start with something small. If its small you think twice about what goes in it! My handbags are usually no bigger than 6 x 10 inches. My handbag has a very small wallet (cash, one bank card, one drivers licence, a bandaid (sticking plaster), and 1/2 an emery board); a pen and the smallest notepad I could find, my PDA; my mobile (cell) phone; a small packet of tissues and my keys. Once upon a time I used to carry sewing kits and a mini medicine chest and who knows what else. Reality - I rarely (if ever) need such items. These days, instead of carting things with me all the time I keep them in the glovebox of my car and/or in a drawer at work. I mean, really, how often am I going to sew on a button sitting on the train or shopping for groceries? And since a packet of Panadol goes out of date before it gets used in our house, how likely am I to desperately need one RIGHT NOW while out? Michele, I think many of us like peeking into other people's spaces! SueBK, I've moved to smaller handbags over time, as I've learned to carry less - but I'm not down to your size yet. (I really do use the very mini medicine cabinet I carry in there.) But I constantly re-evaluate, to make sure I'm carrying as little as possible. I think the container store (the one that was featured on oprah) has a "purse organiser" too! Angelia, you're right. The Container Store sells the purseket. 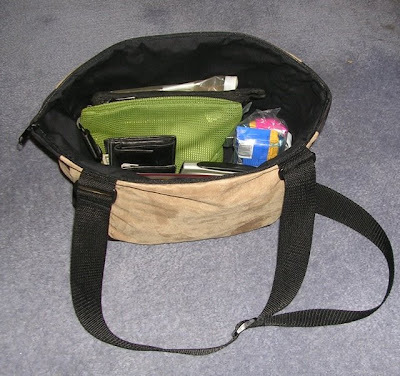 Here's another purse organizer that someone just pointed out to me: the PurseIn. I can't believe all the purse organizers out there. I just purchased this, www.pouchee.com , one. I love it. LisaK, thank you for the pointer to Pouchee.com. I didn't know there were so many purse organizers, either! I'm still using the pursekit you introduced. Altho they sent a larger size it's working well in my backpack purse. 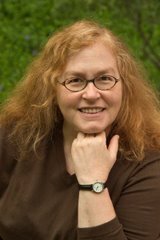 Belated welcome back, Jeri! I'm catching up on your blog. This was a timely post. I just bought three small clear plastic zippered bags to add to the one small black one I carry when I use my tote bag. Whoever invented tote bags was a sadist! All the stuff falls into a clump in the bottom and you can never get to your cel phone before it stops ringing! I use a tote when I'm teaching so that I can easily carry what I need, but it has been annoying to lose track of little items. I think these clear bags will do the trick for me and will make moving the contents to another bag much simpler. Gwen, I'm glad the purseket is working for you. Cynthia, tote bags certainly have their limitations. Sounds like you've got a good work-around. Cards holder is important for all human but you shear in your blog big cards holder or bags of cards so i think its important only for a cards printing company or organization. I'm a new mom (even though he's 10 months old now!) and still have not found a way to keep our diaper bag organized! I've limited my purse to a small Buxton so I don't have to carry a medium to large bag and the diaper bag. Can anyone give me ideas on how to organize this mess? I have the diapers and wipes in a ziplock bag, but everything else seems to float around.